Software programme for managing the DFW, TRI, TRS, CPW, 3590, DGT, DGTQ, and DGT60. series' indicators: there is a customer database in which it is possible to store the indicators which are used. By receiving and transmitting directly the instrument data directly from PC, it is possible to recall the desired configurations and/or transfer them on a similar instrument without repeating the programming from keyboard. Management of the customer database: it’s possible to link to each customer the Dini Argeo scales which are being used, with the objective of storing the calibration and configuration data for each scale, as well as the customisation of the printouts and the contents of the available databases. - Calibration with use of the sample masses, with possibility of linearising the system up to 8 points. - Theoretical calibration, by entering the data of the system to be made (load cells, dead load etc..). - Pre-calibration, in other words, recording the featured data of the instrument board, useful for “cloning” the scale, in the case of its substitution. - Digital equalisation of the cells (in the instruments in which it’s supported). 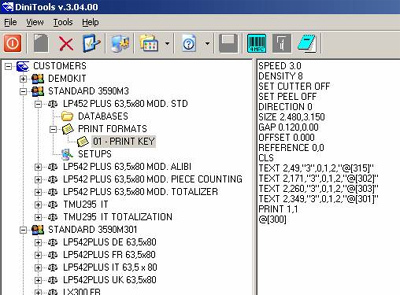 Configuration of the set-up parameters: Dinitools allows to modify/send/receive all the set-up parameters of the connected scale, with the subsequent recording of the executed configuration; possibility of exporting/importing the configurations on the PC. Quick and easy compilation of the databases. Programming the printouts, which may be done easily and simply, with the possibility of satisfying the most common market requests. 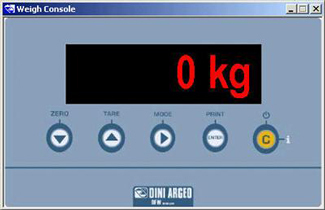 Along with Dinitools, the Weigh Console is also supplied, a programme which allows to read the weight on the PC and store the weight string in any active Windows application (i.e. Excel, Word, etc..). DINITOOLS PC software for indicator management (complete of CD and manual).